The chuckwalla is widely distributed throughout most of the Mojave, Sonoran and Colorado deserts from sea level to 1400 m (4600 ft) (Macey and Papenfuss 1991). It is found in a variety of desert woodland and scrub habitats but is most frequently associated with, and reaches highest densities, in creosote communities. It is restricted to areas with large rocks, boulder piles, or large rock outcrops on slopes. It is less frequently found on flats. This lizard is active from mid-spring to mid-summer and occasionally in fall. Densities of chuckwallas have ranged from 7 to 14 per ha (3 to 6 per ac) (Shaw 1939, Stebbins 1954, Johnson 1965, Nagy 1971, Berry 1974). The chuckwalla is a herbivore, feeding on wildflowers, fruits and leaves of creosote and, to a lesser extent, on other perennials and annuals (Shaw 1939, Stebbins 1954, Berry 1974). This species requires rocky cover such as large rock outcrops, boulder piles or scattered large rocks, usually on a slope but often on a flat (Stebbins 1954). This species lays eggs, and friable, sandy, well-drained soil is required for nesting. In years of less than average rainfall and low plant productivity, reproduction may not occur (Stebbins 1954, Berry 1974). This lizard is found in a variety of habitats but most frequently, and in greatest density, in creosote, exclusively in rocky areas. It is herbivorous and requires the presence of perennial or annual plants, and rocks for shelter. This species can be active all year in warm areas, but most activity occurs in spring and early summer (late March to July). Lizards bask on exposed rocks early in the day, then forage or engage in social behavior. The hottest part of the day involves basking or retreat into rock crevices. Afternoon activity may occur in mild weather. The peak of foraging and reproductive activity is from late April to early June. This species is not known to migrate. Home ranges of males averaged 1.9 ha (4.8 ac) and ranged from 1-3.3 ha (2.5-8.3 ac); female ranges were smaller (Berry 1974). Males and females defend territories. Males tolerate the presence of females in their territories (Berry 1974). Breeding occurs from April to June with a peak of activity in late April to May. Clutch size ranges from 6-13, average 8 eggs. Females may produce one clutch in 2 or 3 years (Johnson 1965, Berry 1974). There are no reports of predation on this lizard but they are probably taken by coyotes and other mammalian predators, larger avian predators, and possibly snakes. Adverse weather can result in no reproduction. Berry, K. H. 1974. The ecology and social behavior of the chuckwalla, Sauromalus obesus obesus Baird. Univ. Calif. Publ. Zool. 101:1-60. Johnson, C. R. 1965. An ecological study of the chuckwalla, Sauromalus obesus Baird, in the western Mojave Desert. Am. Midl. Nat. 73:1-29. Macey, J. R. and T. J. Papenfuss. 1991. Reptiles. Pages 291-360 in C.A. Hall, Jr., editor. Natural History of the White-Inyo Range eastern California. Univ. Calif. Press, Berkeley, California. 536 pp. Nagy, K. A. 1971. Seasonal metabolism of water, energy and electroytes in a field population of desert lizards, Saurmalus obesus. Ph.D. Thesis, Univ. California, Riverside. Shaw, C. E. 1939. Food habits of the chuckwalla, Sauromalus obesus. Herpetologica 1:153. Stebbins, R. C. 1954. Amphibians and reptiles of western North America. McGraw-Hill, New York. 536pp. California Department of Fish and Game. California Interagency Wildlife Task Group. 2005. Size: The stout-bodied chuckwalla is the second largest lizard in the United States, next in size only to the gila monster. A male individual can measure up to 18 inches in total length, while the female is somewhat smaller. Coloration: The coloration of these lizards is geographically variable and also varies between juveniles and adults, in addition to males and females. In adult males, the head, shoulder, and pelvic regions are melanistic, while the mid-body is light beige or tan and occassionally speckled with brown flecks. The tail is off-white. Adult females are brownish in color with a scattering of dark brown and red spots. Young chuckwallas have four or five broad bands across the body, and three or four on the tail. These bands are usually lost in adulthood. Uniformly small scales cover the body, with larger scales protecting the ear openings. Sauromalus is derived from Greek sauros, meaning lizard and omalus, homalus, meaning flat, in reference to the chuckwalla's flattened body shape. It lacks a mid-dorsal crest, and when compared to its closest relatives (the other iguanas), the low profile is obvious. The name ater means black. A previous scientific name used for the chuckwalla is Sauromalus obesus. 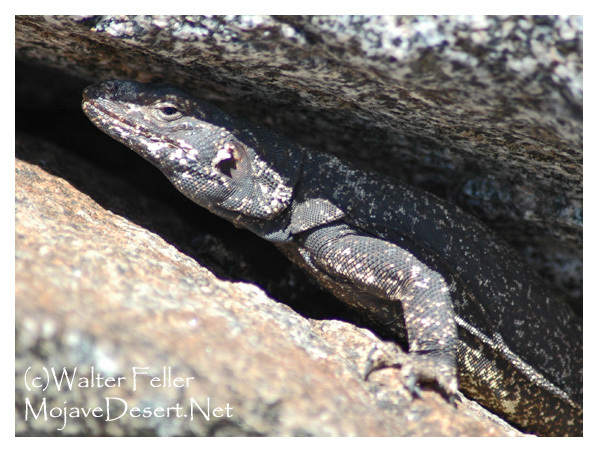 The name chuckwalla (or chuckawalla) is derived from the Shoshone word "tcaxxwal" or "caxwal," the form used by the Cahuilla Indians of southeastern California and originally written in Spanish as "chacahuala." They are big and they look mean, but Chuckwallas (Sauromalus ater) are harmless herbivores feeding on desert flowers, fruits and leaves. Young chuckwallas are known to try a grasshopper or two, but stick entirely to plants by the time they are a year old. Chuckwallas obtain all their water from the plants they eat and never drink, even when water is readily available. Instead of urination to void their body of salts, these wastesare passed as crusty salts breaking up and falling out when the reptile exhales. They are adept at living in rocky areas under 4,000 feet elevation. As well as dodging into cracks of the rocks in which they live when threatened, they inflate themselves with air wedging into the crevices solidly, making it nearly impossible to remove them by brute strength. Since the chuckwalla is a diurnal lizard, predators may also have to be active during the day time hours. The chuckwalla prefers rocky habitats, so predators would have to be able to negotiate and hunt in these conditions. 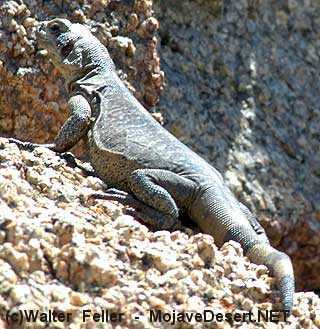 Since the chuckwalla is the largest of the desert lizards, animals hunting adults would have to be of appropriate size. Younger, smaller, lizards have a greater amount of species to fear. "Often we see them waddling along, then suddenly leaping from rock to rock. in spite of their ungainly appearance, they move about with great speed -- in contrast to their profound patience while lying still. One that I found eating flowers in an encelia bush suddenly dropped down and took refuge in a rock crevice. It was more than an hour before it came forth and began feeding again."